Summary of today’s show: The Daughters of Charity were founded in France in the 17th century as a different kind of religious community active in serving the poor and that charism continues to today, including in the Archdiocese of Boston. 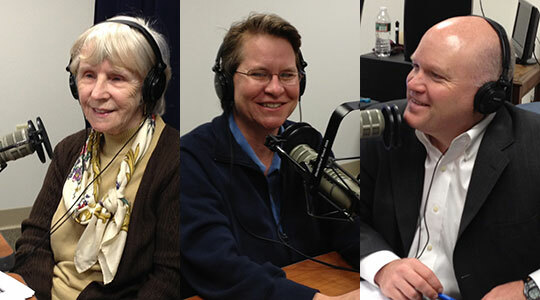 Scot Landry and Susan Abbott are joined by Sr. Denise LaRock to discuss her own vocation story; the story of the founding of the order and how St. Elizabeth Ann Seton brought the community to the United States; and Sr. Denise’s work helping young women discern a vocation to religious life. Today’s guest(s): Sr. Denise LaRock, D.C.
1st segment: Scot welcomed Susan Abbott as a co-host on Monday in addition to her usual Thursday spot. Susan talked about being in the middle of sacrament season in faith formation: first reconciliation, confirmation, and first communion. She prayed for the children and their parents. Scot said today they will profile the Daughters of Charity religious order and some great saints have been connected with the order, including St. Vincent de Paul and St. Elizabeth Ann Seton. 2nd segment: Scot and Susan welcome Sr. Denise LaRock, D.C. from the St. Louise Province of the Daughters of Charity with headquarters in Baltimore. Scot asked her about how she heard God’s call to religious life. She said she was in 7th grade in a boarding school with the Visitation Sisters. It was through the prayerfulness and generosity of those Sisters that she began to consider it. She didn’t even have the seed of faith planted until she started at the school in fourth grade. The school was in Frederick, Maryland. In high school at another boarding school she got the prompting again. Even when wasn’t thinking about religious life, she continued to go to daily Mass. Sr. Denise went to Franciscan University of Steubenville and at the end of her time there that she started seriously discerning. She looked at a lot of orders, but wrote a letter to the Daughters of Charity. She had prayed with each packet she got from each order. She began her student teaching and went to the Daughters of Charity school her brother attended to check out the order. She was attracted to the order because she wanted to serve the poor. They also ran schools, had foreign missions, and wore a habit, and all those were attractive to her. She liked that each sister was unique and different, yet so united in prayer, community, and service. The atmosphere of prayer at Steubenville was key to her hearing the call of God in her vocation. She said at Steubenville there was positive peer pressure to go to daily Mass. There was also a kind of living in community through the Franciscan University household system. She also saw many religious sisters on campus. Scot said telling your family about a religious vocation is often difficult. Sr. Denise said her foster family was supportive when she first brought it up, but they wanted her to wait some time before entering the order. She said young women don’t always get that support from their parents. She said pressure from families is often a big influence on young men and women not answering the call. Often when the parents see how happy the young women is in religious life, they come around and they even become connected to the community. Sr. Denise said she started as an elementary school school. She worked at Mother Seton Academy in Baltimore, serving very poor children. She also worked with teaching children of migrant farm workers in Florida, following the children as families moved with the harvests. she said the sisters often got involved in immigration issues. She noted how workers often were disposable, so when the harvest ended they would be harassed into leaving and being deported. She talked about the stories of some of the immigrants, talking about why people are so desperate to risk the dangers of illegal border crossings. They are desperate to raise their families, to feed them and to keep them safe from the violence in Mexico, they are willing to risk coming here. Scot said these people are our brothers and sisters in Christ. At a time when she was teaching in Georgia, she was on a retreat when the province was considering a new leadership team. The old vocation director was elected to the leadership team, so Sr. Denise said she was willing to take over the job, even though she had been preparing to go to Bolivia for a mission. She said it’s been a wonderful ministry. She notes a lot of women don’t enter the order, but it’s a blessing to see so many women on fire for the Lord. Sr. Denise has been in town for a short visit, going to some of the schools served by the Daughters of Charity, including St. Joseph in Holbrook, as well as attending parts of the Eucharistic Congress. The province covers St. Louis to the East Coast, but there are a couple of vocation directors for the province so they split up the work. She said it’s not about recruitment, so she doesn’t do the hard sell. They don’t just want bigger numbers, they want the women that God is calling. She often works with other religious communities and they work together to find the right communities for women who are discerning. Scot asked what advice she has for parents whose children are interested in religious life. She said they should have the conversation first with the child. In the Archdiocese of Boston, they can contact Sr. Marian Batho, the Delegate for Religious, to get material. Nothing takes the place of visiting the orders and having those experiences. Even for women interested in the Daughters of Charity, she encourages them to look at other communities. Susan said each community has a different charism, a different emphasis or focus. 3rd segment: Scot asked about the founding of the Daughters of Charity. Sr. Denise said the founding is unique. They started in 1633 when all sisters were cloistered. They were originally the servant girls of the parish charities. St. Vincent de Paul had been starting parish-based charities. St. Louise de Marillac had a rough life in her younger years and St. Vincent pulled her out of herself by getting her involved in the works of charity. She’s the patroness of social workers. She was a great organizer. For the servant girls, it was very hard work and there was a lot of burnout so Louise suggested they come together to live in community in prayer. Most couldn’t read or write. She was also nursing her own sick husband and she taught those skills to the young women. Today the community life and prayer are still vital, but it’s in service to the poor. A lot of the terminology of the order today is different because they couldn’t appear to be nuns without being in the cloister. Their original habit was the dress of the country girls. The “flying nun” habit grew out to he bonnet worn by the girls, after the order was disbanded during the French Revolution and came back. Other differences are that they don’t have a novitiate, but a seminary; they live in residences not convents; and they take annual vows, not permanent vows. They have to receive permission to renew their vows each year on the Feast of the Annunciation. Mother Seton was a convert to the faith and was invited to come to Baltimore from New York to start a school for girls. The bishops asked her to start a religious community. She was living near the Sulpicians and they knew the Daughters of Charity so, because the DC couldn’t come to the US because of Napoleon, they sent the rule of the order and they started the Sisters of Charity. Around 1850, the Sisters of Charity in the US most united with the Daughters of Charity in France. The Sisters of Charity continue today. Scot said in Boston we have Sisters of Charity of Halifax, of Ottawa, of Québec, of St. Mary, of Montreal, Nazareth in Kentucky, and more. Sr. Denise said not all of them are tied to Mother Seton. She said the Sisters of Charity federation connects many of those Sisters of Charity orders. Scot asked about all the ministries of the Daughters of Charity. Sr. Denise said they serve Christ in those living in poverty. The three big areas are healthcare, education, and social services. So they have sisters who work in hospitals and clinics, Catholic schools, after-school programs, GED and alternative education, Catholic Charities, meal programs, soup kitchens, social service work. St. Ann’s Infant and Maternity Home in Hyattsville, Maryland is for teen moms. They do prison ministry and mission work. She has some friends in Kenya, others are Magadan, Russia, and Taiwan. Scot asked if the typical sister stay in one ministry for most of her life or does she move from one to another. Sr. Denise said it’s a lot of personal discernment and discernment with the community. Much of it has to do with training and experience. She said some sisters enter already trained as doctors or nurses or teachers. Sr. Denise said over the past 5 years she’s seen a change for the positive among young people toward hopefulness. They are tired of consumerism and selfishness and they are having a sense of being called to something. Scot asked where she goes to find young women. She said it’s about relationship and connecting. There are women who come through their parish presence or ministries. She receives contacts through advertising or retreats or inquiries from the Vision Vocation Network. Scot asked how blogging has helped her work in vocations. Sr. Denise said she tries to look at different aspects of who the Daughters are, highlighting the spirit of the Vincentian communities. It’s a way to meet them online. It helps to know who it is you’re looking at. She said when young people get information on communities, they often look the same, so the blog helps to share the personality of the community. Sr. Denise said she’s never had regrets. She’s met people who’ve had regrets they didn’t check it out. The sisters are more than happy to welcome young women who are interested in checking them out without any kind of obligation. She’s met so many wonderful people and lived with so many wonderful sisters, who supported her in prayer and helped her through tough times.